The #1 c-store brand for so many reasons. Good pizza means good business. 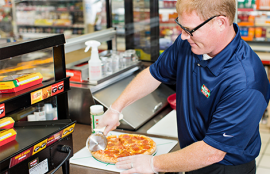 C-store owners across the country use the Hunt Brothers Pizza program to improve sales, drive store traffic and ultimately increase their profits year after year. The program is designed around you, the c-store owner, with benefits other franchise organizations can’t match. Every dollar you make with Hunt Brothers Pizza is yours to keep. No franchise fees, no royalty fees, no advertising fees. Period. You won’t over-spend on inventory. Pizza sells. Quickly. And with weekly visits from your Account Manager, TBHC Delivers will help you stock only what you need, and never sell you what you don’t. You can keep labor costs low. Hunt Brothers Pizza products come to your store 90% complete: every pizza is proofed, docked, sauced and cheesed for fast, simple preparation. Your current staff doubles as your pizza staff, and the product stays consistent for a great experience your customers can count on every time. You can offer the best pizza value in town. The Hunt Brothers Pizza All Toppings No Extra Charge® promise means your customers can choose any or all of 10 premium toppings for one low price. And that not only keeps people coming back for more, it keeps pricing simple and straightforward for you, too. Improve sales, drive store traffic and increase your profits with a program designed especially for c-stores. You’ll have the experts in your corner. With over 50 years of pizza experience and national purchasing power, Hunt Brothers Pizza has had plenty of time to perfect their product and process, so you get a program that’s proven time and time again to be a smart, efficient business move. Increase store traffic with a brand your customer recognizes. 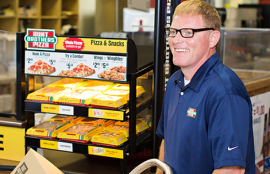 More than 7,000 c-store owners like you have added Hunt Brothers Pizza to their business strategy, so your customers are already familiar with Hunt Brothers’ high-quality products and great value. Maximize your ROI with round-the-clock sales. From breakfast pizza to traditional pies and specialty items like wings, Hunt Brothers Pizza Shoppes sell product all day, every day, so you can seize the sales opportunities in every daypart. Get on-site, dedicated customer service. As the largest distributor of Hunt Brothers Pizza in the U.S., TBHC Delivers has become the industry leader by treating our partners right, starting with our 15-Point Service Promise.